Although it doesn’t seem like there are many obvious tourist attractions, we went exploring and found some fun, delicious, cool and local things to do in Kiev (Kyiv) for you. Digging a bit under the surface, we found Kiev to be a vibrant and bustling city with a unique mix of Western European and Russian culture. There are beaches, a place to get your head set on fire and of course the Chernobyl nuclear plant is nearby. On top of this, amazingly underrated Ukraine is a seriously cheap country that won’t blow your backpacker budget even if you try. 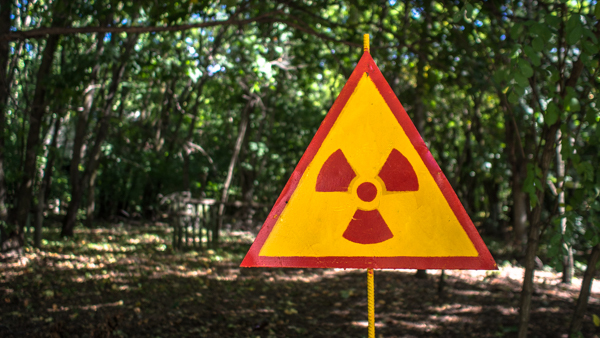 Out of all the things to do in Kyiv, Chernobyl is by far the number one and best thing to do. Not only is it a lesson in how close we came to screwing up the past, it’s also a great time capsule of communist life in the 1980s. As part of your Chernobyl tour you’ll visit Pripyat, a ghost town located just next to the nuclear plant. Pripyat was evacuated in a few hours and the abandoned schools, hospitals, theme park, shops and unit blocks are a unique peek into Ukraine’s past. If you’ve ever played “Call Of Duty: Modern Warfare”, going here will be a trip down memory lane. Don’t let the tour prices scare you off – it’s worth every cent. For much more information on what you see and which company to go with, have a look at our complete guide to Chernobyl Tours. 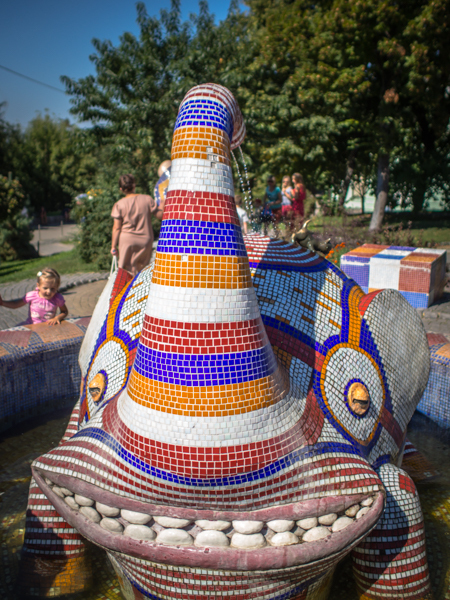 If you’re scared of life-size mosaic animals, then stay way from this one. Otherwise, enjoy being a kid again in the most whimsical alleyway in Kyiv! Started in 2009, this alleyway/park is a sort of mini zoo full of mosaic animals. It has a 30 m wall mosaic of a cat, elephant fountains, zebras making out and a giant cat-shaped playground. As you can maybe imagine, Pejzazna Alley is mostly for children, but it still makes for a lovely spot to stroll around in the afternoon sun. As a bonus, you can even grab a great view of Podil, Castle Hill and the Dnieper River. Go to the beach? When I visit Kiev? That’s right, Kiev has a beach and the locals love it. If you don’t want to go down the drinking avenue and want to get your backpacker body in shape, the free Kachalka outdoor gym is the place for you and all your local mates. This stereotypical Eastern European-looking gym is right behind the main beach on Hydropark and the most fun place to work out in Kiev. It’s not a normal gym, though, with the punching bags made of tractor tyres and the lifting and cardio machines made of old WWII tanks. 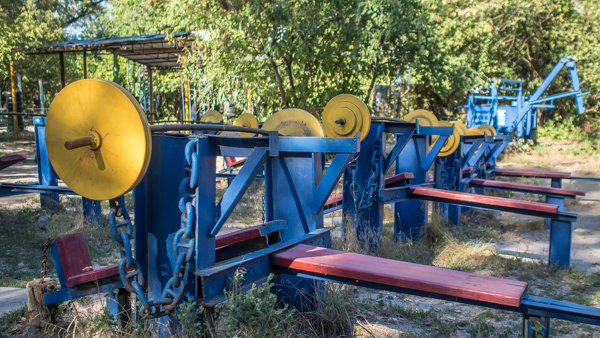 This unusual gym is used all year round, rain, sun or snow, so that the people of Kiev can always lift, punch and climb their way to a sculptured body. On the way to our daily Puzata Hata feast, we would walk past a shop with a line of people going around the block. 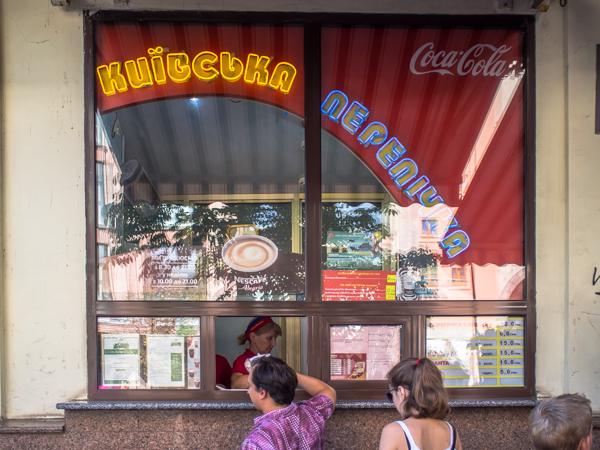 After wondering what was going on for a couple of days, we found out that it’s actually the best place in town to have the Ukrainian street food, “Kiev perepіchka”. Basically, a Kiev perepіchka is the same as a normal hotdog, except it’s deep fried in a magically delicious batter. Kyivska Perepichka has been selling these hotdogs for more than 30 years and no one can figure out why their batter tastes so damn good. Ready to hear the best part? A hotdog is only 5 UAH or €0.20! How to get there: Kyivska Perepichka is on a side street opposite the Zara store. Just look out for a small red window with a thousand people standing in front of it. Some locals hate it and some locals love it, but they can all agree on one thing: the Rodina Mat statue is huge! 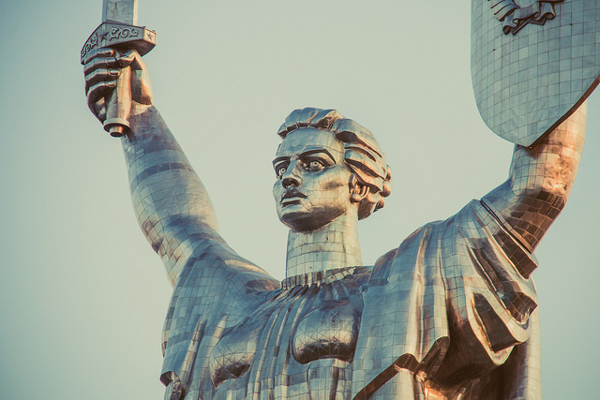 Standing at 102 m tall, the gleaming stainless Rodina Mat statue or “Nation’s Mother” can be seen from almost all points of the city. What makes this statue a cool thing to do in Kiev is the fact that you can literally get inside her head. For 200 UAH, you can ride an elevator up her right leg and look down at Kiev through her very eyes. Now, if you head across the road from Rodina Mat to the Arsenalna metro stop you’ll be able to see the deepest subway station in the world. At 105 m deep it would make for a great nuclear bunker or just a good place to ride a really long escalator. It takes almost 5 minutes to get to the bottom and with some very barren walls the ride down is a great opportunity to have some deep thoughts. Again, the best part is that a metro ride only costs €0.30 in Kiev! As we learned in Lviv, Ukrainians love their nightlife and this was definitely one of the more fun options in Kyiv. Palata №6 is officially an absinthe bar, but with a twist. It’s based on a book from 1982 where a psychiatric doctor becomes a patient in his own mental hospital. This translates to a bar that makes you feel like you’re in an asylum. The bar men are dressed in lab scrubs, you drink from test tubes and – best of all – the staff light your head on fire when you order a shot from them! Okay, not literally your head, but a helmet they give you while you drink 3 shots and get hit over the head with a monkey wrench. I mean, it’s crazy. How to get there: The place is a little hard to find. It’s hidden down a side street, through a carpark, down some stairs and finally through a door with no sign. Your best bet would be to stay at Kiev Central Station hostel (we stayed there and loved it). They’re just around the corner from the bar and can give you exact directions. Kiev’s Independence Square (also known as Maidan Square) is interesting because of its history, but the square itself is a bit bland and won’t take more than a few minutes to take in. The square is the natural gathering point of Kiev and regularly holds concerts, markets, protests and political rallies. The most important event in recent times was the 2014 Euromaidan Revolution where over 100 people were killed. The story behind this uprising is a truly fascinating tale that we don’t have time for here, but suffice it to say that it involves snipers and an American-Russian proxy war. The best way to try to grasp the magnitude of what happened in the square is to join the Kiev free walking tour that does an excellent job of explaining the revolution and its consequences. 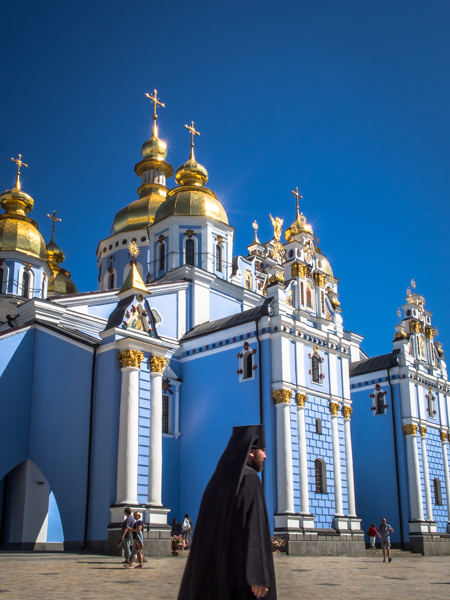 You could spend a whole day dedicated to just churches in Kiev. They are all old and all very cool, but out of them all, St Michael’s Monastery was our favourite. The gold-domed St. Michael’s Monastery has had a rough history and was even torn down in 1937 by the soviets to make way for a planned massive communist square. The communist vision for the square was only partially fulfilled and the monastery was rebuilt to its former glory in 1999. When you get sick of looking at all the churches in town, go for a wander down Andriyivskll Descent. This 750 m long street curves its way down to the Podil neighbourhood from St. Andrew’s Church. Along the way you’ll see the usual tourist stalls, some cool soviet trinkets sellers and a few museums. 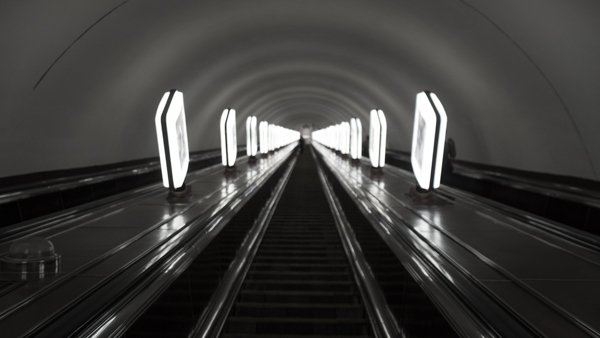 However, what makes Andriyivskyy Descent cool is the arty vibe it’s got going on. There are a few huge murals, some excellent cafes and cheap restaurants – not a bad place to hang out! Sadly, when we tell people we’ve been to Ukraine, they inevitably ask “is Kiev safe?” or “isn’t there a war going on in Ukraine at the moment?“. Well, the answer is yes and yes. Yes, Kiev and the majority of Ukraine is safe. Yes, there is a war going on, but only in the far east of the country. The only thing that’s going to remind you of the war are the recruitment posters that can be found all over the city. Apart from that, Kiev is a very safe, fun and cheap backpacking destination. This is a little note for all our Australian friends who have avoided Ukraine because of the strict visa regulations. Here’s the good news: the visa regulations have changed! Australians can now get a visa on arrival if they fly into Kiev airport. A 15-day visa to this amazing country is 510 UAH. For all the specifics, check out the Australian-Ukraine consulate website. It seems like Kiev has many interesting places. 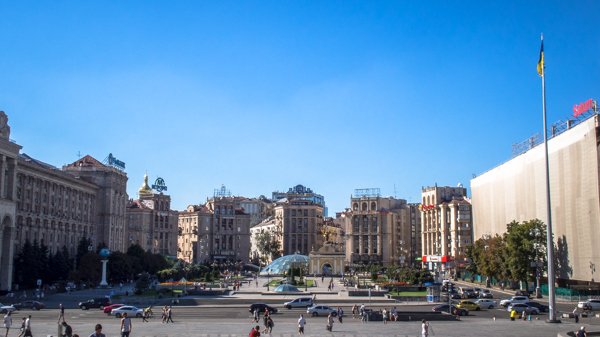 Kiev is a very fun city to explore (and the best part is how amazingly cheap it is)! ? Kyiv is for sure underrated city! Mix of Russian culture? Come on guys, Russian is not equivalent to Eastern European, if that’s what you intended to say. Being Ukrainian I would say choice of words matters. Andryivskyy Street is the coolest- and last time I went, there were a couple side streets branching off where a bunch of artists sold their art, all side by side. I absolutely loved it. So much art if you pay attention to what’s just around the corner!